With the sounds of the babbling brook of Sulphur Springs in the background this picnic area offers a large open sided shelter, picnic tables with grills, access to different Trails, and a restroom facility. 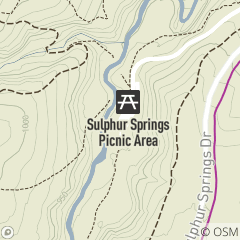 Sulphur Springs Picnic Area is located off Sulphur Springs Drive in South Chagrin Reservation, between Miles Road and Hawthorn Parkway in Bentleyville. Delight in the rich blooms of spring on the Scenic Loop trail with Naturalist Selby Majewski. Preschool aged children and their parents will enjoy exploring nature with a naturalist. Sulphur Springs is a cold-water stream habitat with abundant wildlife in and around it.